... or more overdone hype ? Just when you think you've heard it all, some scientific team comes up with yet another wacko idea to claim their 15 minutes in the limelight. The latest one to catch my eye concerns the Moon. Last August, an article published in the highly prestigious magazine "Science" claimed that the Moon has shrunk at some time during the last 1 billion years of Solar System history. When I read a scientific paper, I start by asking myself whether or not the fundamental premise the paper is based on makes scientific sense. If it doesn't, then I have two choices: I can reject the paper from the outset, or I can continue reading in the expectation that the authors had better come up with some extraordinary evidence to support their extraordinary claims. So let's evaluate this "Late Shrinking Moon" hypothesis against what we already know about Solar System evolution. Things shrink because they cool down, just like your telescope does as the night gets cooler and you have to adjust focus. So let's look at the heating and cooling history of the Moon. The Solar System formed about 4.6 billion years ago, and the Moon formed very shortly after that. The Rocky Planets and our rocky Moon formed from the accretion of smaller particles and planetissimals whose motion - or kinetic energy - was transformed into heat. In the case of the Moon, we can still directly observe the relics of a magma ocean formed by this heating, which progressively cooled and crystallised to form the white crust that we see today forming the lunar highlands. The highlands are white because they are principally composed of the low density, light coloured mineral plagioclase feldspar, which floated to the top of the magma ocean like scum on a pond. All this happened in the first 100 million years or so of Solar System history. Between ~3.8 billion and about 3 billion years ago, the Late Heavy Bombardment left major impact scars on the Rocky Planets and the Moon, including the great Mare Basins that filled with dark lava that erupted from the lunar interior. Given that most of these lavas are significantly younger than the impact basins themselves, the lavas were not produced by the impacts. Rather, they formed as radioactive isotopes of elements such as uranium, thorium and potassium broke down to lead and argon over time, thereby releasing further heat to melt the interior of the Moon. These lavas ceased to erupt in great volumes shortly after 3 billion or so years ago, and certainly by about 2.5 billion years ago, and there is no evidence for volcanic eruptions whatsoever during the past 1 billion years. So, what does all this tell us about the Moon? It tells us that the first half of the Moon's history involved at least two episodes of heating, melting and cooling, but most importantly it tells us that by the half-way mark, the Moon had already cooled significantly. Therefore, if the Moon was going to shrink because of cooling, you might expect that it would have done so in "middle age" at about 2-2.5 billion years ago, not in its "golden years", less than a billion years ago. So should we reject the "Late Shrinking Moon" hypothesis on the basis that the premise is false ? Not yet ! There is a way to salvage it, based on "phase changes" with cooling. 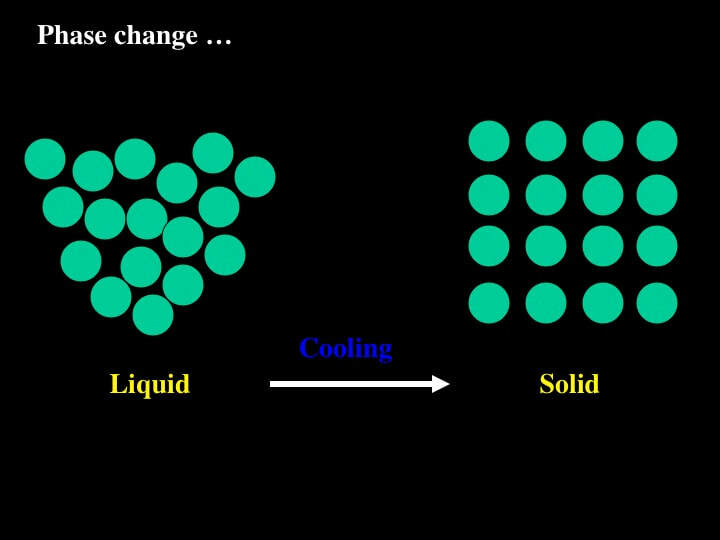 "Phase Change" with cooling is simply a change in the way that atoms of a given composition arrange themselves in a submicroscopic volume of space as temperature decreases. Remember, this is a physical change; the chemical composition of the material remains the same. You are all familiar with the phase change from water vapour (a gas phase) to water (a liquid phase), and from water to ice (a solid phase). What happens during these phase changes from gas to solid is that the water molecules become more orderly in their arrangement. What do you think happens to stuff in general as it continues to cool, to say minus 200 degrees Celsius? It shrinks as the molecules arrange themselves into a tighter spatial arrangement. In other words more mass in a smaller volume, which means a higher density (NB : ice at just below freezing is an exception to this rule). Well, the same thing can happen to minerals deep within a planetary body, except that the phase change is also dependent on pressure. The simple example illustrated here shows 8 atoms in a solid arranged at the corners of a submicroscopic cube. With cooling, the atoms of the solid re-arrange themselves such that a 9th atom is now stable at the centre of the cube, and the cube now has a smaller volume and an increased density. Phase changes such as this occur at specific temperatures and pressures. Diamond is a very obvious example well known here on Earth. Graphite converts to diamond through a phase change at the specific temperatures and pressures that exist at depths of about 150 km below the Earth's surface. So, it's conceivable that the Moon could shrink quite late in its cooling history if a mineral phase change of the kind I have just shown you occurred in its deep interior sometime in the last 1 billion years. However, we have no evidence for any such phase change within the Moon - and certainly not during the past 1 billion years. Even if it has occurred, it would be an extraordinary event - and as the saying goes : "extraordinary hypotheses require extraordinary evidence". So, let's now have a look at the evidence that the "Science" paper presented in favour of late Moon shrinkage - and don't worry, it's all about surface observations, but you'd need a gigantic telescope! ​The evidence presented to support the "Late Shrinking Moon" hypothesis comprises visual observations of wiggly scarps on the Moon's surface. Here's a typical example, and I draw your attention to two points. First, the distribution of shadows shows that the Sun is shining from the left and that this scarp is a relatively steep slope facing to the right. Second, the impact craters in this image are very small pock-mark features, so despite the lack of a scale bar you can tell that this scarp segment is not very long, nor is it very high. Now, what exactly do lunar scarps like this one represent? They certainly represent a local shortening, or contraction, of the lunar surface : this is a function of how they grow. The first diagram on the right shows the undisturbed lunar surface. Next, a nearly horizontal fault forms at some unspecified depth - metres to kilometres - beneath the lunar surface, and ramps up to intersect the surface. "Something" - as yet unspecified - pushes the rocks that sit on top of the fault to the right (red arrow) - up the ramp - and onto the lunar surface. Even for a very small shortening of the lunar surface (green arrow) we now have an asymmetrical topographic high with a steep scarp facing in the direction of motion. This kind of feature is very common on Earth where geologists call them "Thrust Faults". Now, let's take a look at some of the other examples of lunar scarps used as evidence in the "Science" paper. Let's start with the Lee-Lincoln scarp in the SE corner of the Mare Serenitatis. Where is it ? It's down in the lower right corner, running between the North and South Massifs that bound a complicated looking valley where Apollo 17 landed in 1972 (white arrow). It's the faint dashed line in the left-hand image. How big is it ? Well the scale bar in the left-hand image tells us that the scarp is pretty small and not very high. Notice how the northern part of the scarp hugs the foot of the Northern Massif : remember this - we'll come back to it. Let's move to another scarp, this time located on the lunar far-side. The detailed image on the right is a blow-up of the southern part of the squiggly left-facing Mandel'shtam scarp in the other image. Note the scale bars in both images - this is a small feature ! The inset in the right-hand image shows a close-up of the scarp cutting across a small (20-40m) impact crater, thereby demonstrating that there has been some - albeit very minor – movement. This is Slipher scarp, the most spectacular scarp I could find among the examples available on the web - and it's included in the "Science" paper too. The Sun is shining from the left, and you have to admit that, with it's wiggles and branches, it looks pretty impressive. BTW this one is on the far-side too. Trouble is, when you put it in context - within the Slipher Crater - it's tiny. It's so small that I have to help you to see where the tiny white arrow is that points to it ! Yet again, notice how close it is to the high ground represented by the Slipher Crater wall. More on this in just a moment. Time for a well known analogue. When an apple's interior shrinks, its surface wrinkles - or forms scarps if you will - at several scales to accommodate this. You can clearly see that there are lots of uniformly distributed small wrinkles, and a few large ones. How does this compare with what we see on the Moon ? This is a map of the Moon that places the near- and far-sides on the same flat plane. The black dots represent scarps that were already known, and the white dots are new scarps identified in the "Science" paper. We've already seen that the scarps are not long, and here we see that their distribution is far from global and uniform. To be blunt, this looks nothing like our old, dried up apple of the previous slide. From my perspective, things are not looking good for the "Late Shrinking Moon" hypothesis, with or without a phase change. So what do scarps look like on a rocky body that has really shrunk with decreasing temperature ? Several years ago we discussed the scarps of Mercury. These are hundreds of kilometres in length, more than a kilometre high, and are distributed all over the planetary surface. This image of a single scarp shows you just how big the shrinkage scarps of Mercury really are – similar in scale to the planetary curvature. Why does Mercury show such obvious surface evidence for internal shrinkage with cooling ? Because - as rocky planets go - it's weird ! It has a disproportionately enormous metal core compared to standard planet formation theory ... and no-one knows why. But as the core cooled and shrank, it pulled the outer layers of the planet along with it and formed the amazing array of true shrinkage scarps we see at the surface. 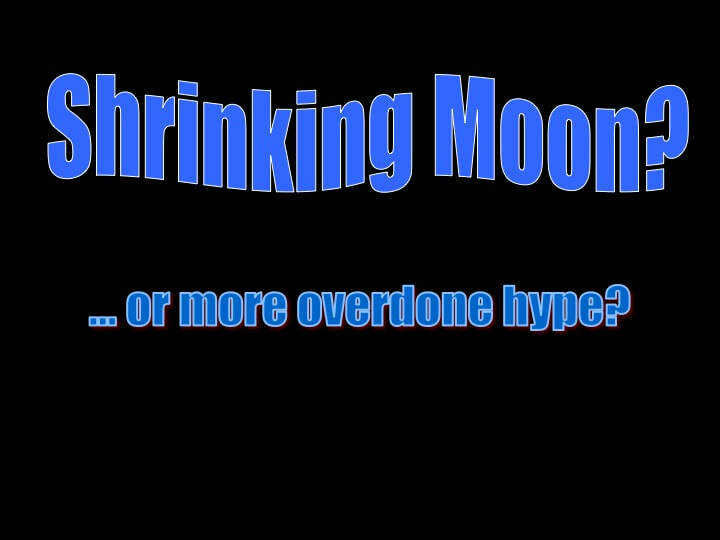 So now you have all the evidence before you, can you now answer the question I posed at the beginning of this talk : have the authors of the "Science" paper come up with some extraordinary evidence to support their extraordinary claim of a "Late Shrinking Moon" ? I would suggest that the answer is clearly no. So the onus is now on me to explain their observations some other way. Fair enough. There's more than one way to feed a cat sour cream, and as a geologist I know that there's more than one way to create contraction or shortening features : it's all a question of scale! ​The Moon is peppered with local topographic highs and lows. The outer parts of topographic highs are commonly weak and can slide. 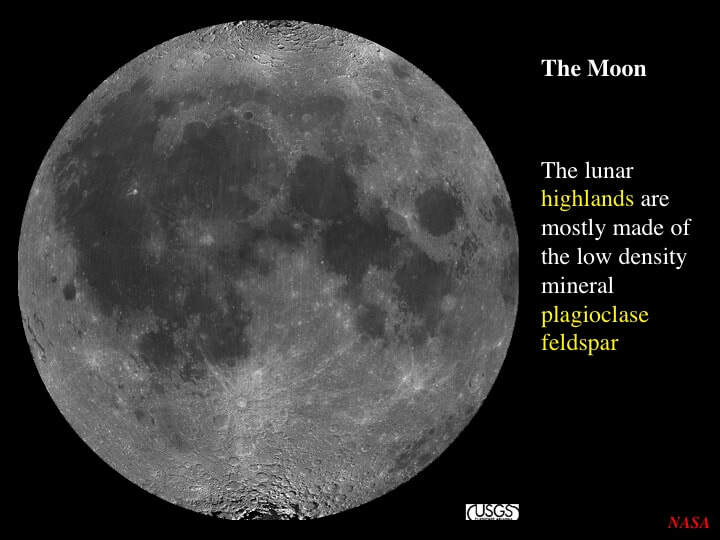 Remember how the lunar scarps are located fairly close to crater walls or to highland massifs ? Material that slides down these topographic highs will tend to locally extend the lunar surface. 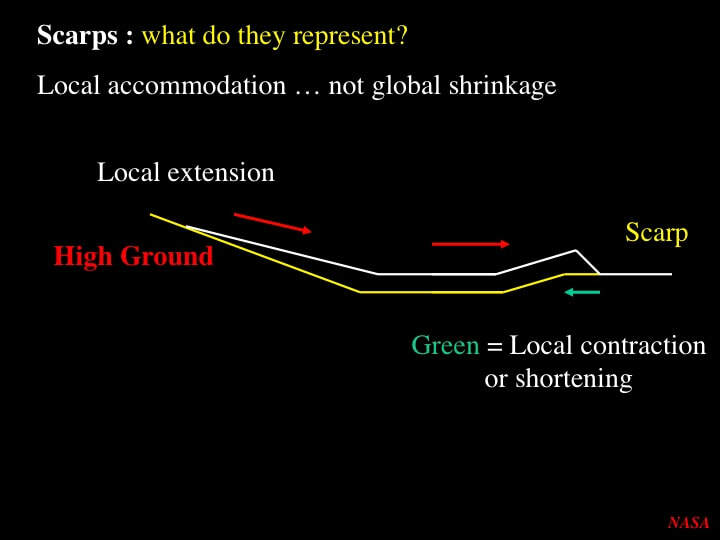 But unless the Moon is growing in size (something no-one is suggesting), the lunar surface must locally contract - or shorten - somewhere else (e.g. at or near the base of the slope) in order to accommodate this, as represented in this simplified diagram. So, as you can see, I'm rejecting the "Late Shrinking Moon" hypothesis because the fundamental premise the paper is based on makes no scientific sense. What do the authors have to say about the non-global distribution of their small scarps? I quote : "Earlier episodes of radial contraction probably resulted in other populations of small-scale thrust faults that are expected to be heavily degraded (by micrometeorite bombardment during the past 1 billion years ?!) and as yet unrecognised". Hmmm, this is one of the weakest scientific arguments I've seen in quite a while.